"The wave pattern seen in the image is not from large ocean waves, however. 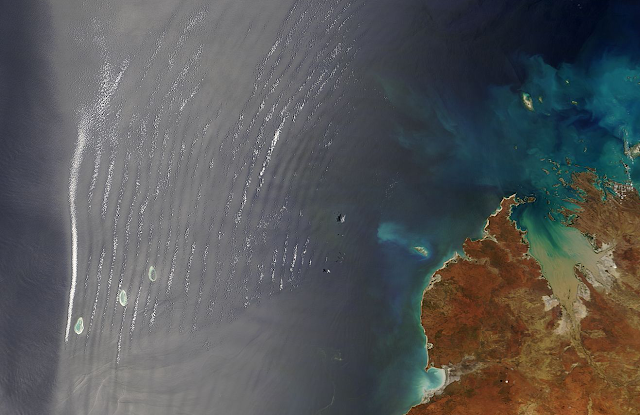 The pattern is of atmospheric gravity waves on the surface of the ocean. As the name implies, atmospheric gravity waves form when buoyancy pushes air up, and gravity pulls it back down. On its descent into the low-point of the wave (the trough), the air touches the surface of the ocean, roughening the water. The long, vertical dark lines show where the troughs of gravity waves have roughened the surface. The brighter regions show the crests of the atmospheric waves. Beneath the crests, the water is calm and reflects light directly back towards the sensor." Some additional details at NASA. These are not the same as the cosmic gravitational waves much in the news this past week. I don't understand what's going on here, but I think it's cool. Yes, it's unfortunate the two phenomena should have almost identical names, because there is nothing Einsteinian about the atmospheric kind of gravity waves. Perhaps it's better to call the latter by their other name "buoyancy waves", as they are basically just air bobbing up and down. Happens all the time when wind hits some kind of barrier on the ground, such as mountains. Mountain pushes air up, gravity pulls it back down, causing a wave pattern. Combine this with different layers of moisture in the air, and you get the typical "mackerel" type of clouds. Sometimes more exotic stuff, too. Thank you, Drabkikker. And that's a good link at the AGU. I never realised that they would have s such an effect at sea-level, I assumed they would dissipate in the lower atmosphere. I am delighted to see this post today- this is my daughter's area of research as a scientist. Usually her first explanation of her work is "gravity waves, not gravitational waves!". She said that the first person to have discovered them was ridiculed for his novel theory.